Hy-Pro 5ft Velvet American Pool Table - Blue. DPT 6ft Slate Bedded Pool Table. Refurbished Pool table With New Red Hainsworth woollen Directional cloth on bed and cushions. Cabinet is in average condition for an ex operational table usual dinks and scratches as shown in the photos. Who will see victory and who will be defeated? Providing endless fun for parties, sleepovers, summer holidays and long winter nights, the WICKED GIZMOS ® Table Top Pool Game provides hours of entertainment for anyone who plays, and includes everything that you could expect from a full size game of Pool, only in miniature size for your convenience. SUPERLEAGUE POOL TABLE 6ft Classic Pub Table. Condition is Used. Got to go due to large building project starting soon. In good working order. This is located in Woodingdean just on the out skirts of Brighton. All cues and rests balls triangle brush chalk on string included in this sale. 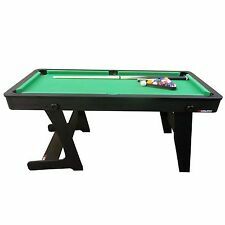 7ft Revolver Full Size 3-in-1 Pool / Air Hockey / Table Tennis Family Game. 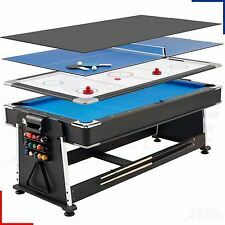 Air hockey, pool table & table tennis combination table! new is £399. Reversible pool & air hockey table with table tennis top. This is 6 foot version. Tennis net and bats included (didn't make to the pictures.). 6ft Pool table slate bed complete with cues and balls good condition. Condition is Used. Collection in person only. Pool Table Trolley. Suitable for 7 x 4 foot coin operated table. You are bidding on a pool table trolley suitable for a 7 x 4 foot coin operated pool table specifically. Needs a clean up an a spray with matt black paint. I think the top is slate and it is really really heavy, we've never moved it as its so heavy. Getting rid of as we need the space to extend to build downstairs bedroom for disabled child. This is a high quality pool table in good condition with slate bed, made from solid wood everywhere and not veneered. Leather and brass pockets. T he slate bed separates from base and legs are removable, connected with 16 bolts. BCE Pool Table - Folding 5FT. Condition is Used. Collection in person only. 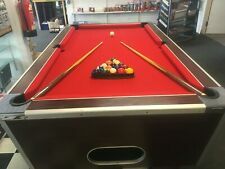 Included: Full set of 1 7/8” pool balls 10 red set of 1 7/8” snooker balls 2 x 4ft cues 2 x 3ft cues Chalk Spare tips Triangle The table is in good condition, and folds up to store easily. It has a couple of small nicks in the cloth, but nothing that affects the play. Dimensions are 5’ x 2’ 6” Pockets are nets rather than a ball return system. Please note: no delivery, collection only from Newton Aycliffe (DL5). Before bidding please ensure you have a method of collection. Cash on collection preferred rather than PayPal. Thanks for looking. slate bed pool table, Pub Size. Condition is Used. Collection in person only. Condition is Used. Collection in person only. Minimal assembly required - the table is pre-built - just attach the legs. PHOTOS OF ACTUAL TABLE. Fast action high-response competition grade rubber cushions. 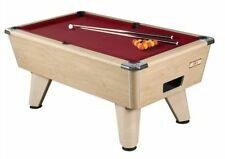 Beautiful table to play with good cushion bounce & fast play SAM BILLIARDS BISON 8' x 4' professional pool table & accessories. recovered in sam billiards nylon special speed blue cloth a few months ago has suffered a light drink stain which doesn't affect play. Pool table 7ft x 4ft Omega made by DPT Liverpool. Slate bed. Slate bed. This is a slate bed so very heavy item. Good quality table. I re-felted the top around a year ago and hasn’t been played since, however there are a few small holes in the cloth where it been left stood and I think mice may have got to it but does not affect the playing. Mahogany style dining table, with a solid mahogany main frame. 6'2" x 3'8" Mahogany veneered top is removable for playing. Slate bed, cues, triangle, set of spots and stripes balls. 4 dining chairs. Will not fit in new house. Collection in person only. Condition is Used. Well looked after. 1x Black Plastic Triangle. 1x pool cue. 4x chalks. Stylish and ideal for living room or Den. Red cloth surface with dark brown trim on table edges, pockets and nets. Fold away 6x3 Snooker / Pool / Table Tennis Table . Condition is Used. Comes with snooker balls, triangle, 2 cues, table tennis net. 7ft Pool Table freeplay just been recovered in green wool 2new cues New red and yellow balls triangle and every think else you need tables in very good condition please feel free to message me for a delivery quote or can pick up in person. New listingpool table dining table. The Amalfi from Liberty games. Pool table 6ft. Completewith two piece pool cues, with spots and stripes pool balls and triangle. Debut6ft Cincinnati pool table in very good condition. Beecheffect table finished with fast action cloth and upholstered cushions. All item that are sold are 100% new of high quality. pool table top full size 7ft. Working hours Sun - Closed. Sat 11 till 5pm. Product supplied ready assembled but legs can also be folded for easy storage. Pool table 6ft x 3ft. p ool balls. w ooden triangle. Table Top Pool Table. Condition is Used. Collection in person only. Collection is from SE96RQ Eltham. This is the Pool Table Order Confirmation. Small Riley Pool Table For Kids. Condition is Used with signs of ware but still playable. price reflects condition. Collection only from East Finchley, North London. Payment by cash preferred. 2 sets of balls. 1 Hockey puck. 2 hockey pushers. Table top twists over without the need to lift it. Table brushes. Superleague 6ft coin operated, slate bed pool table, used. 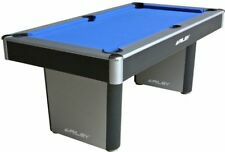 Superleague 6ft coin operated, slate bed pool table, royal blue baize . Used but in good condition. Takes old 10p coins, a bag of these is included. 4 Cues and one rest and rack included, cues need new tips, small hole in baize close to cushion as per picture. Balls are slightly discoloured due to age. Reluctantly putting up for sale as moving into a new place and will no longer have the room required. I've never had one or needed one, but I was assured they are easy enough to get hold of. In excellent condition - used only twice. Full set of cues, balls, rest, triangle and chalk. The pool table is in good condition. Buyer will need to collect. Leeds United Slate Bed Pool Table. Condition is Used. Snooker, pool and spots and stripes balls and cues all included. In good condition. Was recovered about 4 years ago. Buyer to collect. Used condition. Table tennis top with 2 nets, 5 bats, ping pong balls. Darts board with 9 safety darts. Collection only. Cost £275 new. POOL TABLE with Folding legs. Length 140cm. Plus Snooker set. Length 140cm. POOL TABLE with folding legs. Well made complete with cues, balls, scoreboard & chalk for cues. Width 74cm. NEW! 12X BLUE MASTER BILLIARD SNOOKER POOL CHALK FREE DELIVERY! 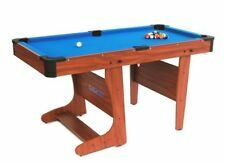 Pool tables are available in a wide choice of sizes and designs, from large scale professional standard 6ft pool tables and American pool tables to mini/novelty toy table top pool playsets for kids. 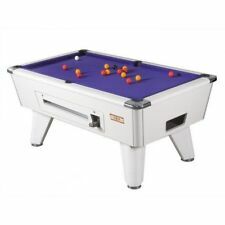 Pool tables can be found with ball options to include pool, billiards and snooker to offer up multi play choices. Many pool tables are covered in green or blue wool mix baize and feature a full set of accessories to get started including balls, cues, rest and head and triangle. Pool dining tables offer a comfortable place to dine and have fun for all your family and friends, allowing you to transform a dinner party setting into a games area in a few steps. These tables are crafted from quality hardwoods and usually have slate beds, adjustable legs and removable tops. The significant difference between English and American pool tables is size, with English pool tables at 7ft, which is the standard used in Pool Leagues countrywide. In addition, 6ft pool tables are also available which are ideally suited to smaller rooms or as pub pool tables where space is at a premium. Large 8ft pool tables offer even more area for the cue ball to move in, as well as greater potting distances, offering the serious player a more challenging game. American pool tables are much larger than English pool tables, with sizes starting at 8ft and being used at 9ft as the US sporting standard. No nap on the woven cloth makes for faster play, balls are bigger in diameter than English versions and pockets are subsequently much bigger in size. Traditionally, UK balls were red and yellow, with spots and stripes covered pool balls in the US. Today, many buying choices will be available in both types and your final decision will be down to personal taste.